Camping in the Smokies is camping with beautiful views. What a great place to have the family experience nature! Below are three places you’ll love to come relax and camp. Twin Mountain RV Park—Whether you’re a tent camper or you love your RV, Twin Mountain has it all. You’ll never have to leave this place to have all the fun you need or amenities you may be looking for. Just plan your vacation and have fun. Here’s some of the fun your family is in for: river tubing, swimming in the pool (with a kiddie pool for younger swimmers), basketball, tennis, fishing, and they also have a game room with a pool table, ping pong. Kids can also enjoy the playground next to the laundry house. You’ll love that all sites have water/electric/sewer, concrete pads, free Wi-Fi, 30 & 50 amp service, picnic tables, and central heat and air in 3 bath houses. All of that in Pigeon Forge on the banks of the Little Pigeon River! Smoky Mountain Premier RV Resort—When you camp do you like a lot of room for you and your family? 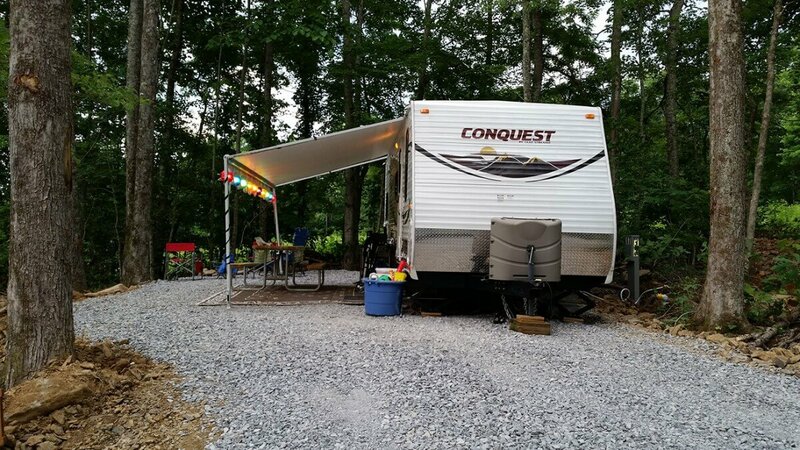 Their lots are twice the normal size of other campgrounds in the area. This is a gated and great location, between Gatlinburg and I-40 with preserved shade. This is no ordinary campground. Their amenities are as huge as their 16 acres with Wi-Fi, private restrooms, laundry, fitness facilities, golf cart rentals, disc golf, a playground, a swimming pool, and a lot more. It also borders the Great Smoky Mountains National Park so only certified local firewood is permitted, but available for purchase in the campground store. Anchor Down RV Resort—A luxurious RV Resort for your family. How does camping on lake front or lake view sites sound? How about fireplaces, concrete pads, full hookups, paved streets, cable hookup, free Wi-Fi, and bath house with private bathrooms? The views are gorgeous there, located on Douglas Lake, with beautiful views of the Great Smoky Mountains. Located in Dandridge, Tennessee, 18 miles from Dollywood, about six miles from Smoky Mountain Knife Works, about 9 miles from The Sevierville Golf Club and near seven other golf courses. Also voted best small town on the water 2013 by Life on the Water magazine. What about primitive camping? The Great Smoky Mountains National Park has you covered. Which type of primitive camping do you love most? They offer backcountry, frontcountry, group campgrounds, and horse camps. If you just love hiking miles to your campsite then Backcountry is the way to go, but you do need a permit and advance reservations for overnight stays. Backcountry is suited for smaller groups, but you can get a special permit for groups with up to 12 people. Frontcountry camping is great for camping close to your car. There are 10 developed campgrounds in the park with restrooms, cold running water, and flush toilets. You can make reservations online and each site has their own restrictions, open/close dates, and fees. Similar to picnic grounds, they also provide a fire grate and picnic tables. If you’re planning a group campout, they offer groups of eight or more, located in Frontcountry. The horse camps are small campgrounds, accessible by vehicle that offer hitch racks for horses and primitive camping. If you want an accessible horse campsite with potable water and flush toilets, reserve at Big Creek. Find out more in the Smoky Mountain Campgrounds sections.